Joy of Sets episode 6 Tonight! As part of a new mock-autobiography released by H.G. Nelson (Greig Pickhaver) called My Life In Shorts, Brisbane’s Courier Mail (24/10/11) printed a Top 10 list of mockumentary-style TV shows, Books and films. 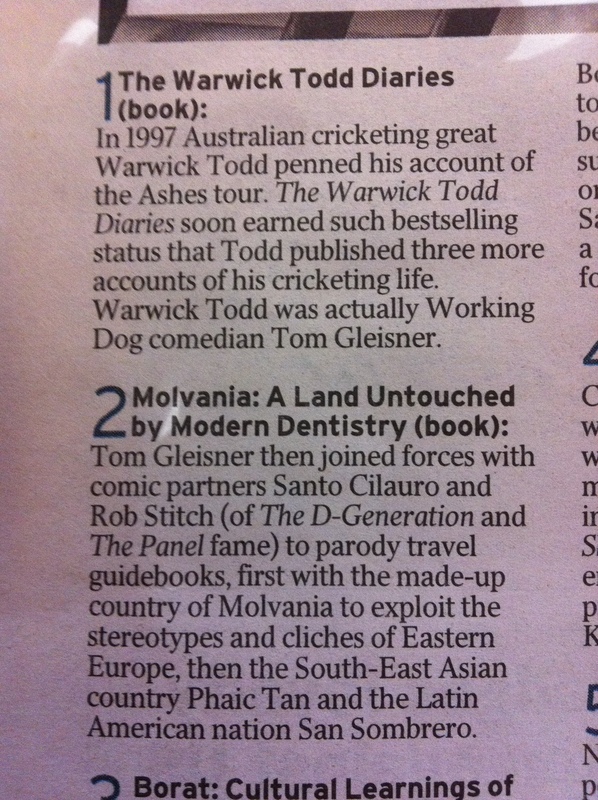 Tom Gleisner‘s Warwick Todd Diaries and Rob Sitch, Santo Cilauro and Gleisner’s Movania Jetlag travel book series. If they’re missing from your extensive book collection, they’re still available through all good book stores and $2 bargain bins. Nice to see they spelt Santo’s name right, but they dropped the ball after that with Rob “Stitch” – medical in-joke? I only just noticed that – good pick up!